Drouth: It’s Fall after a very dry Summer, and there is very little water to be found in Purisima Creek Redwoods Preserve near the Pacific Coast just a few miles south of Half Moon Bay. A few yards off the trail, I spotted this tiny water fall— just enough water for a photo, but not enough to ease the drought. My black & white photography class was visiting the preserve for a photo shoot — I took the northernmost trail up Whittemore Gulch. The trail leads towards Skyline Road, which is 3 miles up. I stopped at the first steep climb to take my photos; end of hike for me. 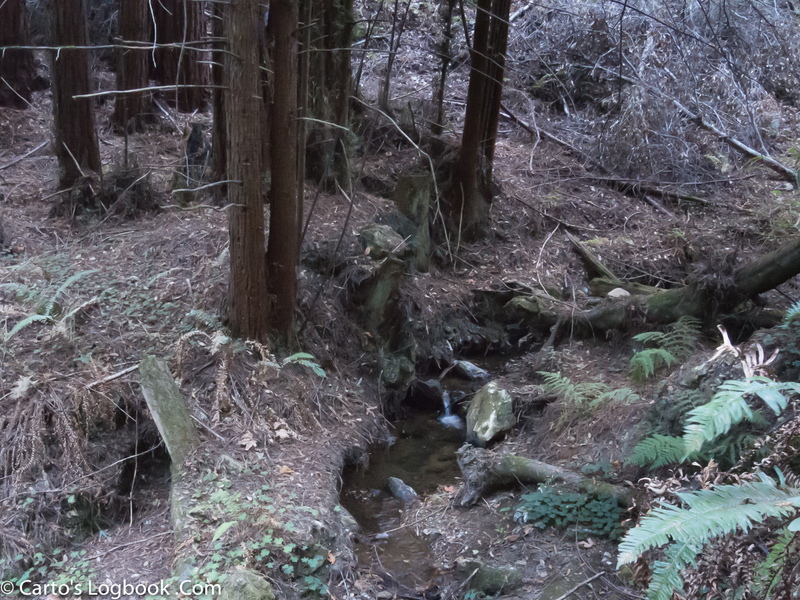 There it is at the bottom-center of the photo, my little rivulet and waterfall as it flows past a small grove of redwoods that had grown from the stump of a much larger tree. The stump must be over 100 years old since this site was first logged in the late 1800s. By the early 1900s, all of the trees that were not too small, too twisted, or too inaccessible were gone from Purisima Canyon. There were seven recorded mill sites along the creek banks in this Preserve. Redwood was used for shingles in the building of San Francisco after the Gold Rush, and for lumber throughout the Peninsula. Purisima Creek Redwoods Open Space Preserve is located on the western slopes of the Santa Cruz Mountains overlooking Half Moon Bay. The centerpiece of this 4,711-acre Preserve is Purisima Creek Canyon, with its towering redwoods, rushing creek, and understory of ferns, berries, and wildflowers. 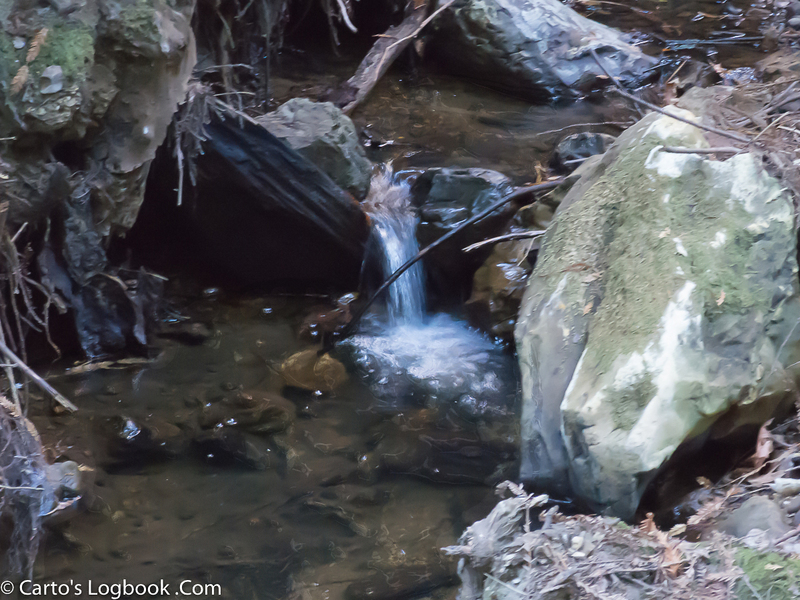 On the Saturday that we visited the preserve, there were plenty of Redwoods, but the “rushing creek” described above was reduced to muddy ponds fed by little rivulets coming down the gulches that line Purisima Canyon. Follow this link to check out the work of other WordPress Bloggers. This entry was posted in Travel Blog, weekly Photo Challenge and tagged California, Half Moon Bay, Photography, Purisima Preserve, Travel by carto. Bookmark the permalink.